This week, we’re excited to meet up and introduce Paul Olenick, Director of Product Strategy at AvePoint, to hear more about AvePoint’s integration of Power BI Embedded into their applications. AvePoint is a leading Microsoft Cloud ISV, helping over 15,000 companies worldwide accelerate their journey to the cloud. Saptarshi Mukherjee, Senior Product Marketing Manager of Microsoft Power BI, met up with Paul to discuss the work they’re doing. Saptarshi: Can you tell us more about AvePoint? Paul: AvePoint is an ISV that has been a part of the Microsoft ecosystem since our founding in 2001. We started with a SharePoint backup solution and quickly grew to develop a fully integrated suite of products helping customers with data management, governance, and compliance. We’ve continued to evolve alongside Microsoft, and that’s meant a significant investment in the cloud in recent years. This year, we began an exciting new venture in our Microsoft partnership by developing AvePoint Citizen Services – an AppSource solution for government agencies or citizen-support non-government organizations (NGOs) to automate case management and incident reporting. Saptarshi: How are you using Power BI as a part of your solutions? Paul: We use Power BI extensively, both internally and as part of our software solutions. Within our products, we currently leverage Power BI Embedded in AvePoint Cloud Insights and AvePoint Citizen Services. 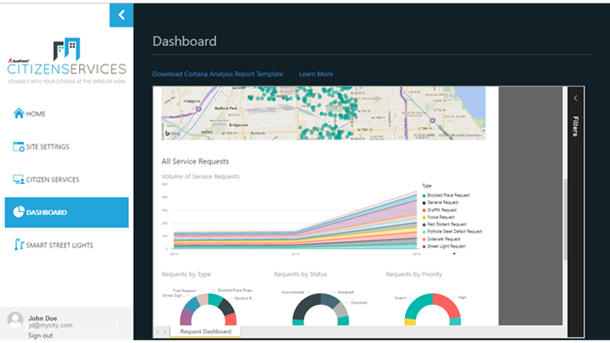 Cloud Insights is a solution that allows customers to visualize their Office 365 sites, content, and usage via a set of rich interactive dashboards. AvePoint Citizen Services offers a SaaS platform that makes it easy for governments of any size to modernize their case management, improve customer satisfaction, streamline their operations, and surface deep insights about their municipality. In addition to Power BI, Citizen Services also leverages Azure IoT, Machine Learning, Cortana Analytics, Dynamics 365, and other cutting edge Microsoft Cloud technologies. Saptarshi: Why did you choose to use Power BI Embedded? Paul: AvePoint has been developing software products for over 15 years, and many of our solutions include graphing, reporting, and charting capabilities. We’ve employed numerous methods for developing visualizations over the years. When we subsequently developed Citizen Services, we used Power BI Embedded reports, with their built-in interactivity, filters and long list of chart types – ultimately, being far richer and more engaging than alternates we had considered. We were already sold on Power BI Embedded based on our experience with Cloud Insights. Saptarshi: How did AvePoint go about evaluating, planning, and implementing Power BI Embedded into its solutions? Paul: We evaluated Power BI and Power BI Embedded by building out several proof of concept scenarios. We did this by staging data in Azure SQL from systems like Dynamics 365, which Power BI can connect to natively. We then built out Power BI reports using Power BI Desktop and used Power BI Embedded to embed them within our own pages. The familiar tooling, WYSIWYG editor in POWER BI Desktop, and built-in visualizations made the task impressively quick and easy. Our developers were pretty much immediately sold on it. Saptarshi: Can you tell us about key design decisions you made during this process? Paul: One of the key design requirements for us, in both products, was multi-tenancy and customer data isolation. We were able to easily isolate the data and workspaces for each SaaS customer and deliver unique reports to the customer’s users. With Citizen Services, specifically, each customer provides its own Dynamics 365 instance that we use as the back-end to its unique Citizen Services portal. In our SaaS platform, we developed a service that exports service request data (requests that citizens make of their cities) from the customer’s CRM instance to a SQL Azure database (each customer gets a dedicated table in the DB). 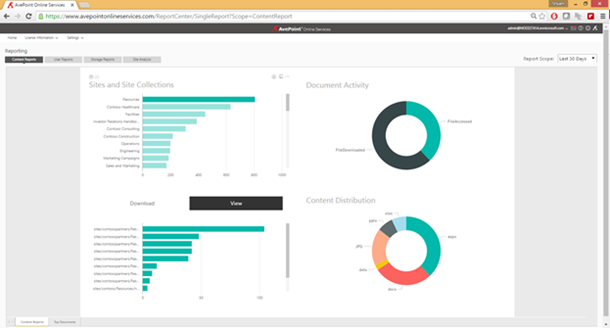 We then create a single Power BI workspace for each customer, which includes the Power BI Embedded report. The report and data are associated with the customer so that when they login to their internal portal, they’ll see the dashboard specific to their city. Saptarshi: What has been the benefit for your business and engineering teams? Paul: We were able to create modern, rich, and interactive reports in our SaaS applications at a fraction of the cost and effort that we budgeted. Because the reports are embedded within the solutions, customers don’t need to have a special license, or even know that Power BI is driving the experience. Because it’s built on the Microsoft stack, and is very simple to boot, we hardly needed to make any investment – whether cost or time spent learning – in a new visualization tool set. It was a nice win for the engineering team. Saptarshi: Those are great insights Paul! Thank you for taking the time to speak with us. It’s been a pleasure talking with you about AvePoint. For more Information on AvePoint, please visit the company’s website. You can also learn more about AvePoint Cloud Insights or AvePoint Citizen Services. Learn about Power BI Embedded, or get started with Power BI Embedded now.